This is another very special issue in my personal history with the turtles: this was THE first issue I ever got of TMNT Adventures at Waldenbooks as a then-new issue “off the rack,” still some months before I ever discovered such a thing as a comic shop. Along with that, the way I’ve mentally divided the series into “seasons” over the course of this re-reading project, I do see this as a “second season” finale. The issue starts with a shot of the outside of a couple stores, as we’re left to imagine the naked Bebop and Rocksteady doing their shopping for clothes and guns. As they gather supplies, we return to the main thrust of the action–the TMNT vs. Slash, Bellybomb, and Krang as Shredder’s head. The bulk of the story is the details of the fights–Krang/Shredder vs. Leonardo, Donatello and Mikey vs. Bellybomb, and Raph vs. Slash. While they all fight, we find Bebop and Rocksteady freeing zoo animals, while bantering and generally enjoying themselves. Slash gets distracted remembering that he’s looking for his palm tree and leaves the fight; Bellybomb is knocked out by his own “mega-halitosis” and Raph gets Krang of Shredder, leaving the villain in the turtles’ debt. When Bebop and Rocksteady show up leading an army of dangerous animals, the turtles are out-gunned and out-numbered and consider cashing in that debt…but turns out the mutant duo is quite satisfied simply with the turtles admitting defeat. They just want to go home, and agree to take Bellybomb and Krang with them. So the “season” ends with Shredder leaving to ponder the turtles’ having saved his life and “owing” them; Krang and Bellybomb are left back on Morbus (but not on a sinking barrel this time). Slash finds his palm tree and seems happy. The turtles return home…and Bebop/Rocksteady, too, return home. We have to continue on to the backup for April’s whereabouts, but that ends on a bit of a cliffhanger such that I could live with it within the “season” analogy. Chu Hsi has brought forth the Warrior Dragon, and attempts to rescue Fu Sheng from the ninjas that’ve kidnapped him. Though the Dragon has little physical trouble with the ninjas, one of them throws a strange powder in his face…causing him to revert back to human form, and the naked fireman is dragged off with April unable to do anything but watch. When I first read this issue more than two decades ago I had no idea who Bellybomb or Chu Hsi were, where they’d come from, etc. They were just simply “there.” I’d recognized Slash from the action figure; the turtles and Shredder/Krang as well as Bebop and Rocksteady were givens, of course. However, the Shredder/Krang relationship obviously was not what it was in the cartoon, and Bebop and Rocksteady are portrayed quite differently here than in the cartoon but everyone was still obvious as to who they were and all that, otherwise. From the dialogue between them, we get a lot of exposition on Rocksteady and Bebop as well as the clarification that they actually DID start out human, but have the MEMORIES and such of the animals they were mutated from (apparently a slightly different mutagen than what transformed the turtles and Splinter). I’m not entirely sure if I’m disappointed at that or not, having come to kinda like the notion of them being mutated animals rather than mutated humans. I’m not entirely sure how I feel about the two leaving the turtles…on one hand it’s a letdown and inconsistent with their brash talk in other issues of dealing with them. Yet, given their time on the Eden planet and such, I can accept it. All the more as I believe this is the last we see of them until the TMNT 30th Anniversary Special from IDW last year. The backup story is another short snippet that goes by rather quickly and simply. I appreciate its placement as a separate thing from the main story as that allows it to breathe while not being shoehorned into the main story. Knowing what it leads to certainly colors my perspective and lends “meaning” to it, as the story otherwise seems rather generic, getting such a little piece of it here. Having Allan back on pencils for the entirety of the issue is a welcome thing, main story as well as backup. Liking his work, I don’t have much to say on it except it’s good and this being roughly where I joined the series it makes sense that he was a definitive artist on the characters for me. If this were a tv show, I suppose the backup stuff would have been worked into the main body of the “episodes,” leaving us on Chu Hsi’s capture as the cliffhanger to keep us hooked for the next season. Well, there goes my thoughts of a consistency moving forward with Allan on art…or at least, that was my first thought with a different style to the art from the first page. Turns out this is a split issue with a lead story and a backup! The lead story finds Krang and new allies Bellybomb and Slash arriving on an “Eden planet” (planets set aside by elder races of Dimension X as nature preserves/places of peace). Conveniently they arrive not only at the PLANET Cherubae sent Bebop and Rocksteady, but in the very field the two are hanging out. The ship having let its live cargo off, the group is free to return to their Earthbound journey, no longer captive to the ship’s auto-programming. On Earth, Shredder prunes a bonzai tree while lamenting his recent defeat…even as the turtles draw close, having found this latest base. While they fight, Krang has piloted his gang to the HQ and crashes in, leaving the turtles to fight Slash, Bellybomb, Bebop, and Rocksteady while he hides and waits for Shredder. Krang’s plan for revenge and acquisition of a new body prove a “two birds/one stone” situation as he takes control of Shredder’s body, somehow attaching himself to Shredder’s head/face. The art’s a bit “off,” with both Ho and Lawson splitting the story. After so enjoying the previous issue, the art on this one is quite a letdown. It’s not bad, but definitely different and not what I was expecting. Ho‘s work has come to be somewhat familiar, though I found Lawson‘s part seemed to be a lot different than his last time around with this title. Compared to Mitchroney and Allan, though, this is not a preference for me. Though we got a full 20-page story, we also get a “backup story,” starring April as she meets up with new friends Chu Hsi and Fu Sheng. When Fu Sheng is kidnapped, and Chu and April are unable to take on a small army of ninjas, Chu calls forth the warrior dragon spirit to aid the situation. I had completely forgotten about this backup…I was thinking it’d be a few more issues before we’d hear from Chu and the Dragon again. I’d also forgotten that the “solo April stories” started this early in the run. Though the story is a rather short, fast-paced segment, it’s cool to see April on her own, competently handling a katana, and having a life away from the turtles. Granted, we only really see her with a couple people the turtles just recently had involvement with, but the point stands. She’s not just simply hanging out with the turtles or fulfilling some stupid damsel-in-distress role. I don’t recall how many chapters there were to this backup series, but it might throw a small wrench into my “season” analogy if it carries beyond two chapters. I’d have to research Allan‘s work to see if this was his first series, and if there’s anything on why he was on the backup and not the main feature. Still, seeing more of his depiction of April is a welcome treat, and I look forward to the next issue. Well…THAT is more like it! Other than vaguely recalling that Krang was in this issue at some point (mostly from the cover), I couldn’t have told you what the story was about off the top of my head. But reading the issue? It was just an enjoyable experience! We have YET ANOTHER new artist on the book in Chris Allan. From what I recall, though, this change STICKS. While I quite enjoyed Mitchroney‘s work, I’m pretty sure Allan stayed on for quite some time and it’s his work that I most associate with the book, through most of the rest of its run. The visual style is similar to what’s come before, but a bit different from Mitchroney‘s; a sort of pleasant consistency with a hint of difference that settles in as the run goes on. For this issue in particular, I just like the look and feel of the various characters. 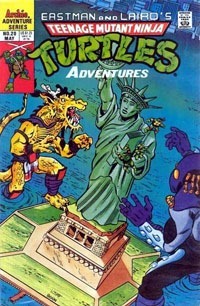 The turtles head to Chinatown while April stays behind to continue her training with Splinter. On Morbus, Krang meets Slash, who rescues him as the two ally themselves for the foreseeable future. They soon come across a just-arriving prison/transport ship and assist the prisoner in defeating the guards, and the group heads toward Earth. As this is going on, the turtles find some kids preparing to use a bazooka to hit an armored car on the street above from the secrecy of the sewer. Though the bazooka goes off, ultimately the kids are no match for the turtles who leave them for the authorities while taking their guns to destroy them…little knowing the threat headed toward Earth. I like the narrative style of this issue, with dialogue serving to transition back and forth between the events on Earth and Morbus. While Shredder’s bursting back into things a few issues ago was outta nowhere, this issue gives us the “subplot” detailing Krang’s allying himself with new/alien characters to make his way toward Earth. As said at the start of this post…I really enjoyed this issue as a whole. We have the turtles in both low-key and action sequences…we have April just hanging out with them as well as continuing her time with Splinter; we have Krang, we have new characters, and we have build up to a new conflict as we head toward what I’ve come to see as a “second-season finale” with the return of this villain that was defeated at the end of the first “season.” (Yet, unlike contemporary 2016 comics that are marketed somewhat as “seasons,” this series maintains its ongoing numbering with no reboots or variant covers or such). Compared to the previous three issues, this is fantastic, and I think I’d recommend jumping from #19 and the Mutanimals mini-series to this and just ignore #s 20-22. I imagine it’s just a typo and a missed error, taking stuff for granted…but reading through this issue I was really taken aback by a panel with Shredder addressing Splinter as Hamata Yoshi…rather than the long-established Hamato Yoshi. Were the letters upper/lowercase I’d wonder if it was a case of faded or blurred ink or such, an ‘o’ coming to look like an ‘a’, but the all-caps nature makes the ‘A’ pretty darned distinct from an ‘O’. And I suppose if one’s working with the material all the time, stuff will come to be taken for granted, though I’m not sure if the blame here lies entirely with the writer or letterer, though I’d share blame across both and the editing team for missing the spelling of a primary character’s name. That all said, this isn’t a bad issue on the whole, though it feels–again–rather generic in the larger scope of things. We open with a recap of the last few issues, bringing us to Leo, Mikey, April, and Splinter barging into a trap laid by the Shredder, though it’s essentially “we know it’s a trap” and “he knows we know it’s a trap” and “we’re going in anyway because we have to” and “he knew we’d have to and would” and…yeah. So ultimately we wind up with a Shredder/Splinter battle, and just when it seems Shredder’s about to win, a new figure bursts onto the scene and pretty much defeats Shredder…though the figure is revealed to be Raphael, back (without Mondo Gecko) from stopping the alien invasion. The group’s joyful reunion is short lived as they soon notice that Shredder has escaped. But hey, at least the group is back together. Despite–or perhaps because of–the Shredder’s presence and involvement, this feels like a weaker, generic story to me. I don’t care for the character, and at least for my contemporary 2016 sensibilities being applied to 25-year-old writing geared toward a different age range, I don’t like the lack of explanation of Shredder’s escape, nor having had any foreshadowing whatsoever to his return. This is probably all the more frustrating to me as a reader now because of my high regard and rose-tinted lenses “memory” of all the numerous subplots I tend to think comics used to carry that would weave in and out of “major plot point” status. Simply AS a TMNT story, in the established continuity, this works, especially with Splinter’s continued active involvement over sitting at home waiting all the time. I know what comes later in the series, so like with the lead-up to the Mutanimals stuff, I’m eager to get to the next several issues for personal reasons, so forcing myself to slow down for an issue like this holds added disappointment. We again have a different artist on the book…Gene Colan. Unlike some of the other “fill-in artists,” this is a name I recognize (and having paused for a few moments to look up and confirm where I know the name from, I’m even more impressed, as Colan was involved in a lot of early Marvel work). The visual style is similar to earlier presentations of these characters, but different enough to notice that there’s a difference. I appreciate Colan‘s Shredder more than the other characters, and once again also appreciate the coloring, which maintains that much more consistency despite different artists, in a way that I’m sure would be a far more jarring shift issue to issue otherwise. 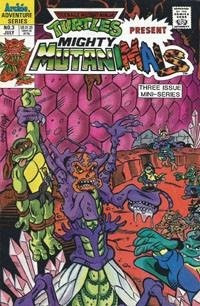 I hold that this is another issue that could easily be skipped…really, though I’m glad the Mutanimals got their own spin-off stuff, the Mighty Mutanimals mini-series would have worked just fine for me within the TMNT Adventures series even if it meant three months of no Splinter, April, or Leo/Donnie/Mikey. While a lot of the earlier issues of this series were ones that I could recall the basics of the issue’s events from before, just looking at the covers…I had this one chalked up as a random, forgettable one-off. I was a bit surprised (even as my memory of the events were rekindled) at some of the issue’s events. Rather than a mutant-creature-of-the-month, this issue gives us a mutant/cyborg character in Vid Vicious. Vicious is an ordinary human fed up with bad news about the human-generated destruction of the planet. He gains the power to "do" something about it when a satellite fuses with chemical waste and crashes into the ground outside his cabin. 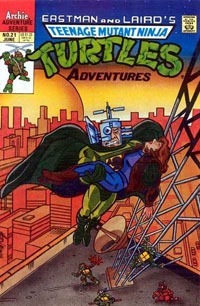 Meanwhile, the turtles spar as they wait for April and Splinter…but before those two can rejoin them, Vicious appears through April’s computer monitor and kidnaps her. It turns out he wants her to record/broadcast his message to the world before he disrupts world wide communications. Fortunately, Donatello’s able to track him, and the turtles arrive to save April. Our heroes gain the upper hand, and the cyborg tries to escape into a nearby computer, but Donatello hitches a ride and is pulled in with him. 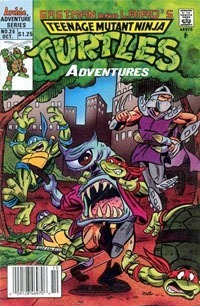 While the group tries to figure out how they might be able to rescue Donatello, Shredder with some Foot bots bursts in. As the bots are fought, Shredder messes with the computer, copying Donatello and Vicious to a disk before escaping out the window, leaving the turtles shocked and horrified at what they’ve just witnessed. Vicious is hardly an inspiring villain, nor all that interesting to me. His existence is rather preachy and dated–this whole issue is–and leaves me rather cold. The story is very much of its time, and continues the trend of including an educational narrative within the fiction/fantasy of the issue itself. I’m just not all that appreciative of it right now as an adult. I’m definitely put off by the way computers are depicted here…but then, this comic is a QUARTER-CENTURY old, and computers (and their depiction in media) have come a long, Long, LONG way since early/mid 1991. Despite that–and strange as it may sound–there’s a part of me that sees Shredder’s disk with Donatello and Vicious as being akin to the flat-crystal Phantom Zone from the Superman films and later-2000s pre-52 DC continuity. In that sense I’m ok with it, abstract as that may be. Visually we have another new/different artist on the issue, and though the style isn’t bad it’s a little weird-looking to me. The characters all seem a bit more cartooney than usual, and some of the perspectives seem just a bit "off" to me. Shredder’s appearance is out of nowhere to me…though I can appreciate that from the sense of leaving us as readers on the same page with the turtles, there wasn’t even any foreshadowing that he was thinking of escaping, trying to escape, or had escaped prison, so even though I somewhat suspect that’ll be detailed in the next issue, for now with THIS issue it just came from nowhere. As with #20, this seems somewhat filler-ish while the Mutanimals mini deals with the main payoff and action for the month, leaving this as a secondary story. I’m almost certain there’s recap in the next issue such that this one really isn’t essential to "get" that story. Given that, this is another issue than can be pretty easily passed by–It’s hardly a "mythology" issue and primarily only counts if you’re trying to read every single issue for the sake of having read every single issue. Back in the days before "everything" was collected in full runs in collected volumes and every issue might be someone’s FIRST, there might not necessarily have been a recap page…stuff might simply be given as exposition in characters’ conversation or some such. In the case of this title, we get a several-page recap of the previous issue and Mighty Mutanimals #1 and then pick up immediately from there. 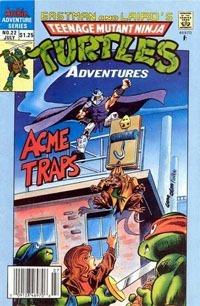 Null, Scul, Bean, as well as Raph and Mondo Gecko (stowaways) are gone via alien spacecraft, leaving the other turtles, Splinter, and April to deal with the arrival of police at Null’s building. The group escapes into Chinatown…but before they make it back to a sewer they witness a huge fire. When the sound of a baby is heard from within, one of the firemen–Chu Hsi–rushes in to save the child. An old man with a shop on the bottom floor throws a golden, dragon-shaped container into the building, where it smashes next to the fallen fireman…and the dragon spirit within bonds with him, transforming the fireman into a giant golden dragon. The turtles, old man, fireman, and April leave, though the fire still rages. Meanwhile, a giant Foot soldier bursts out of a building untouched by the fire and begins to menace the area. The turtles spring into action fighting it, but with no success. Splinter realizes the fireman can call forth the dragon at will, and encourages him to do so. The dragon puts a quick end to the giant Foot bot, the fire burns itself out, and Chu Hsi is left with the old man from the shop to face a future in which he is bonded to the spirit of the ancient dragon. After the lead up to the Maligna/Invasion stuff, and the Mutanimals mini-series and then the event itself, this issue is quite a letdown for me. There’s also the huge plot-hole in that I simply cannot "believe" that the Statue of Liberty having a giant robot land on it would survive unscathed. This story takes us back to the "mutant of the month" in a sense, introducing us to a giant golden dragon–an ancient spirit bonded with a human fireman. That he immediately trusts the turtles and they he is another plot point that seems over-simplified…but I’ll accept it for what it is. I recall that this character comes back into play later, in what I’m going to consider the "third season" of this title…but otherwise this seems like just a generic one-issue/one-off tale to get the turtles away from Null’s building and move things forward despite the missing Raphael. Visually we have an entirely different art team than usual, which is rather noticeable to me. I’m not all that keen on the turtles’ appearance…but I rather like Splinter and April…and the dragon himself looks good throughout the issue. The giant Foot bot works for what it is, but I’m not all that impressed and echo the turtles’ question of when/where Shredder would’ve had the resources to have the thing built to begin with. 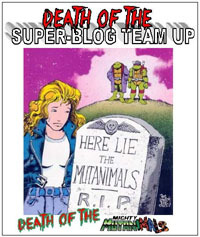 I do like that the bot’s "speech bubbles" are skulls, indicating that it simply wants to kill…and I chuckled to myself when–after the turtles had "annoyed" it–the skulls showed with bandanas around ’em as the bot had refocused on killing the turtles specifically. As a whole, this isn’t a bad issue though it’s far from a favorite. Recalling that Chu Hsi is a recurring character lends some "importance" to his introduction here for me, though he’d otherwise seem to be just a one-off throwaway that’s full of potential but not really explored. While Clarrain as writer maintains a consistency of sorts, this feels like a sort of "filler" issue, like this title’s on hold while the main action unfolds in the Mutanimals mini. I’m looking forward to issues 23-25…but not so much the next couple issues (21-22). Aside from seeing the on-panel introduction/first appearance of Chu Hsi and the Dragon, I’d consider this an entirely skip-able issue. In classic comics style, we open on a full page split by the issue’s title–Ride of the Ruthless–that starts us where we left off, recapping the end of the previous issue AS we move into this one. On Earth, the Mutanimals fight the malignoids…Cudley carries them to Dimension X as they’re knocked out. On Maligna’s ship, Raph and Mondo Gecko are being drenched in honey to be eaten alive. The ship arrives in the Amazon where the Mutanimals have just defeated the batch of malignoid warriors. Scul and Bean jump into things, while a horde of malignoid ships spew forth from the mothership to terrorize the entire planet. Kid Terra rescues Raph and Mondo, while the Mutanimals defeat Scul and Bean…though they can’t do anything about the army of ships that flew right past them. Though this is another Mitchroney-penciled issue, we have yet another inking team, giving this issue another varied look from the previous two. It’s not horrible or anything, and Grossman‘s colors provide a bit of consistency within the framework, but it’s noticeable and I’m not entirely thrilled by it. I suspect a large part of the reason for this was to get the job done and the issues out in a timely fashion, as this was running concurrently with the ongoing TMNT Adventures title (specifically issues 20-22, I believe). The story itself seems to come to a bit to convenient an end and I don’t recall there being any real repercussions explored in terms of this invasion having happened (or at least begun). There’s hardly any mention of being sure that Maligna’s gone for good or even any reason for her to not blast our heroes the moment she’s away from Kid’s guns…and her vow to return when least expected flies in the face of any honor-system for leaving. But that’s certainly the adult me analyzing this where stuff worked just fine as a kid reading the story. Things were epic and huge and important because the characters talk of them being so, and I wasn’t thinking about external factors or ways to apply the story to worldwide real-world sensibilities. I certainly enjoyed this more as a kid, but appreciate it quite a bit now as an adult. I do look forward to getting back to the main TMNT Adventures issues, but also the return of the Mutanimals in their own book. 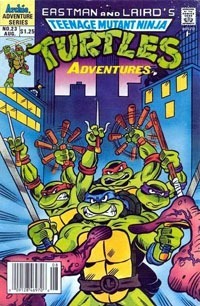 Raphael guest-starred in this moreso than anything else, I think, to have ‘a Ninja Turtle’ involved to “tie” this to the TMNT for anyone who “had to” have and read anything TMNT-related but who otherwise wouldn’t care about the Mutanimals themselves. While expanding on and then tying up the “loose end” of Maligna, this series also allowed a great reason for so many strange characters that were previously in drastically different places to be brought together in one place and giving them a “home” outside of individual random guest-appearances. 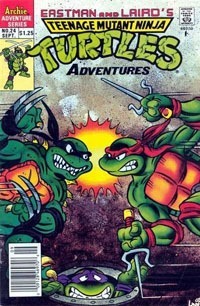 This also allowed for more story in a short span of time, with double the number of TMNTA-continuity issues to be out without double-shipping the main title itself (twenty-some years before “double-shipping” was a “thing” and it was simply standard for a single series to have one issue per month). All in all, the Mighty Mutanimals mini makes for a good read and I certainly have enjoyed re-visiting this story and period in TMNT history.